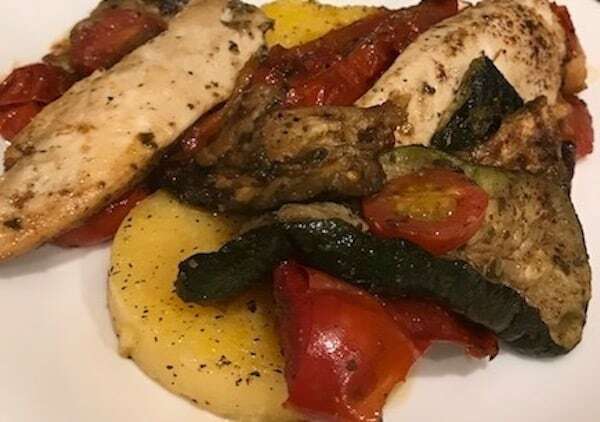 Chicken and Polenta is a dish most of us don’t hear about often. However, it is super easy to make and delicious, so it is perfect for a family dinner. Another thing I like about it is the fact that you can make it with whatever vegetables you have on hand. Not only that, but you can also season it with your favorite herbs and spices. This simple meal tastes much more elaborate than it actually is. What’s nice is that you don’t have to mention to anyone that this is a quick and easy dinner that anyone can make. One of the things I’ve experienced is that polenta can be difficult to find. So if you don’t know where to look, ask your grocer. Although they may not carry it now, they can probably order it for you. Until then, grits will work as a polenta substitute. It comes in dry form typically in the grocery aisle or in a tube in the produce section. I found both forms at Harris Teeter. When you’re ready to prepare this dish, just ask for polenta at your favorite grocery store. Polenta is basically the same thing as grits—cornmeal that is ground and cooked with a liquid to make it mushy. It takes on the flavor of whatever you cook it with. This is why I use chicken or beef broth most of the time. If you have the tube of polenta from the produce section, you can slice it. You can still use chicken broth. I like to sprinkle a seasoning blend on it for extra flavor. 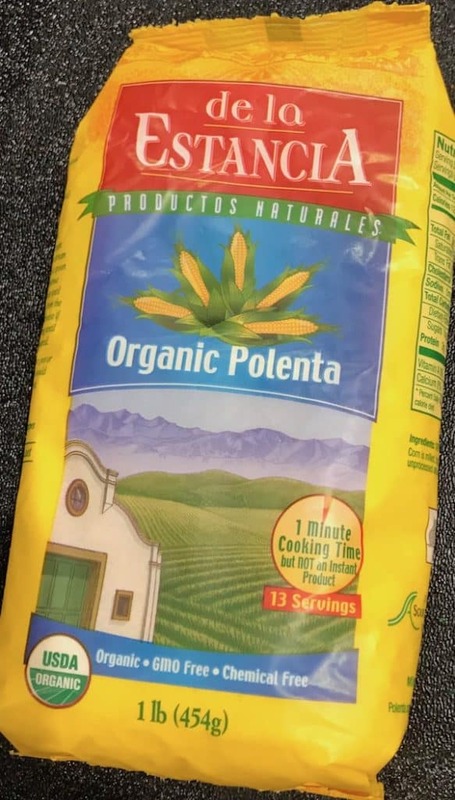 If you’re vegan, you can cook polenta in water with salt, pepper, and other seasonings to give it flavor. It’s a nice dish to have with roasted or sautéed vegetables. You’ll also love the fact that polenta is gluten free. Since all of the ingredients in this dish cook quickly, I like to get the polenta started first. Then I cook the chicken, add the veggies, cover it, and wait for everything to be done at the same time. First, cook the polenta according to the directions in the package. I normally use half chicken broth and half water when making it from the dry version. If you get the tube of polenta, you can slice it and fry it. However, boiling it enables you to infuse more flavor. Next, brown the chicken in olive oil or butter. Remove the chicken from the pan and add the vegetables. After you sauté them for a few minutes, put the chicken back in the pan, add the seasonings, and cover the pan. If you want, you may add 1/4 cup of shredded Parmesan cheese to the polenta while it’s still in the pot. I normally don’t in case someone doesn’t care for it, since it can be added later. You have now mastered cooking chicken and polenta. Yes, it’s that easy. All you have to do now is put it on the plate, and it’s ready to be served. I either spoon some polenta onto the plate or place the sautéed patties on the plate. Then I scoop the chicken and cooked vegetables over it. Finally, I spoon some of the liquid with the extra seasonings over everything. After all, we don’t to miss out on some of that yumminess. If you enjoy an explosion of flavors in your mouth, this will undoubtedly become one of your favorite meals. Serve it to company when they come for dinner, and they’ll undoubtedly see what a brilliant cook you are. Check out more delicious recipes at The Country Cook Weekend Potluck! 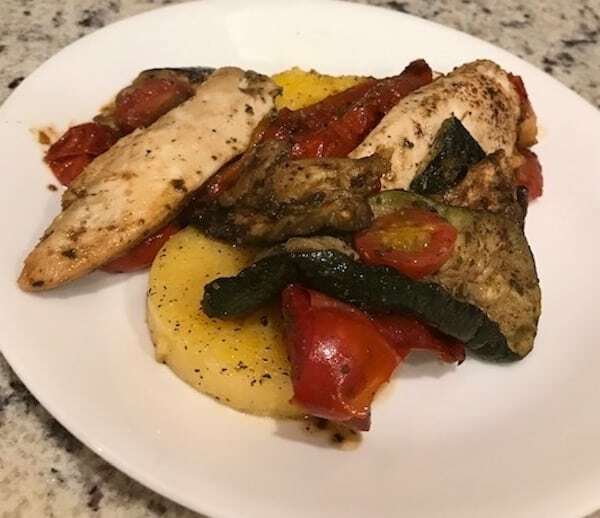 The versatile polenta provides a nice base for this tasty dish with seasoned chicken and vegetables. Slice 8 half-inch pieces of polenta from the tube. Fry it on medium heat in a skillet sprayed with nonstick cooking spray. Season it to taste. After the polenta is as brown as you want it, pour the broth over it to add flavor. In a large skillet on medium high heat, brown the chicken in the olive oil or butter. Season to taste. Once both sides of the chicken are golden brown, remove it. 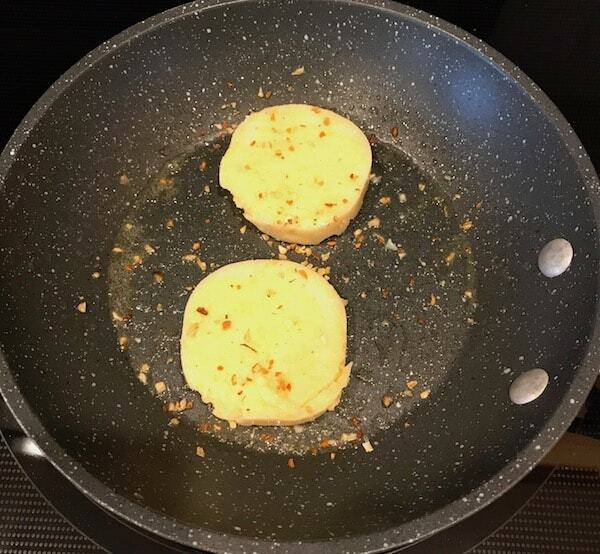 Put the eggplant and tomatoes in the pan and sprinkle with seasoning blend, salt, and pepper to taste. Sauté them until they start to brown. Put the chicken back in the pan, cover the pan, and turn the heat down to medium. Continue cooking for about 10 minutes. Scoop the cooked polenta onto the plates. Top with the chicken and vegetable mixture, making sure to use the seasoning at the bottom of the pan. 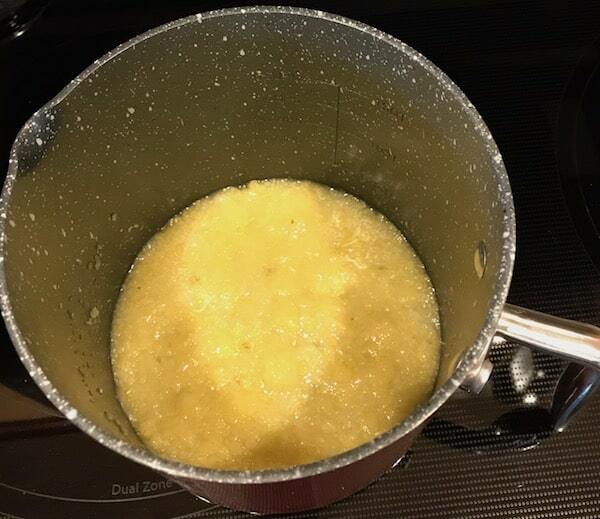 Alternate step 1: If you use the dry polenta, bring 1/2 cup of chicken broth and 1/2 cup of water to a boil in a medium saucepan. Add the polenta and cook until it has a mushy consistency. Prepare the chicken and vegetables while it cooks.